Before the development of the railways, the majority of the British population had never travelled further than 10 or 20 miles from their homes. 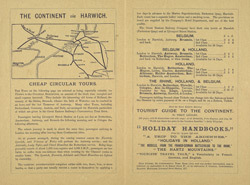 By the late 19th century, most major cities and towns had been connected to the rail network, and so travelling across the country for work or family visits became much more feasible. The trains were cheap, fast and efficient. In 1888, there were as many as 29 trains a day between London and Manchester. The Great Eastern Company's first railtrack opened in 1839, travelling between Mile End and Romford.